There is a strange paradox in much of the church today. The very things Jesus promised would happen if we follow him are often the very things that cause us to doubt his presence and love. But what if the supposed detours in life are the direct route to true blessing? Last month in the nation of Niger, more than 55 church buildings, some homes, a couple of schools, and an orphanage were burned in one day by religious extremists. The perpetrators sought to burn my house, along with two other homes belonging to our team working in a village on the outskirts of the capital. But various neighbors stood in the gap as they arrived at our gates, confronted the mobs, and suggested these homes be spared. The story unfolded on a Saturday morning as our team (ROCK International) was hosting a weekly children’s Bible club in the courtyard of one of our homes. Interestingly, that morning was the distribution of Samaritan’s Purse Operation Christmas Child boxes to a couple of hundred kids. Twenty minutes before the mobs entered our village, neighbors tearfully approached the club warning the team of the impending danger, giving time to move to a safe location. Our team prays daily for the salvation of this nation, but do we tacitly require from God our terms and conditions? Do we seek comfort and belonging in a world that crucified and rejected our Savior? Do we embrace complacency when Christ calls us to intimacy? The problem is not that we cry out to God in desperation, but rather that we fail to realize we are always desperate for him. Often, these adverse circumstances make that desperation a tangible reality. While walking near my house in the village, days after the violence, I approached a home and local church that had been burned. 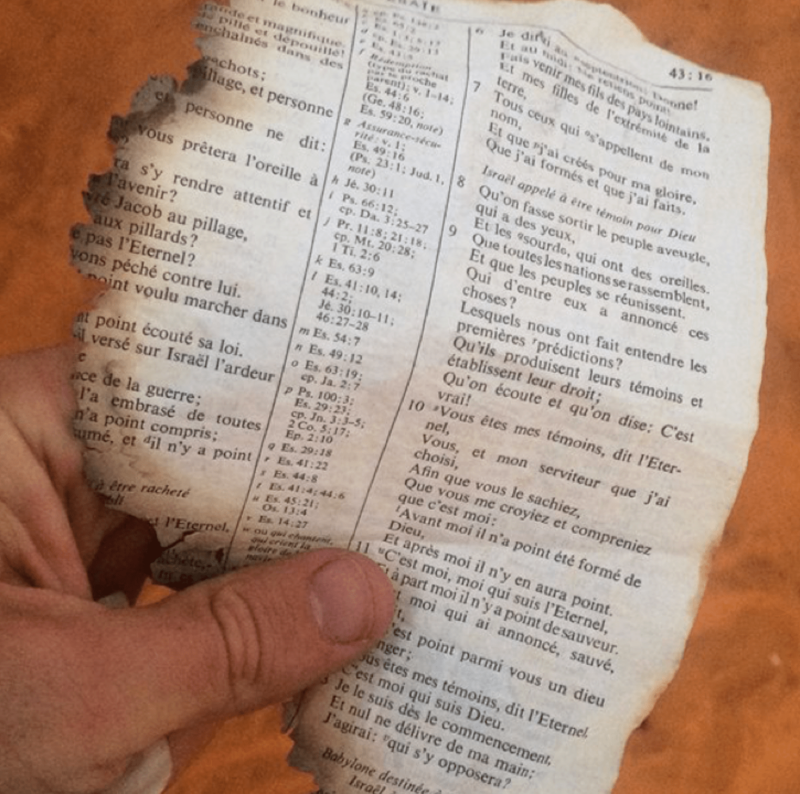 The street was littered with pamphlets, Christian resources, and charred Bible pages. Randomly, I reached down and picked up a half-burned page of Scripture only to see it was the first half of Isaiah 43. How encouraging to be reminded in the rubble, “When you walk through fire you shall not be burned, and the flame shall not consume you. For I am the Lord your God, the Holy One of Israel, your Savior. . . . Fear not, for I am with you” (Is. 43:2b-3a, 5a). Christ never promised physical safety to those who would follow him. In fact, he promised something far better: his presence. When commissioning his disciples before ascending to his Father, Jesus told them, “Go, therefore and make disciples of all nations . . . ” and left them with this promise: “I will be with you, even to the end of the age” (Matt. 28:19a, 20). Sometimes the physical flame does touch our life, but Christ took the flame of God’s wrath and judgment that we might forever enjoy life. Christ was forsaken on the cross that we might eternally dwell in God’s presence. In our world today, more than 40 percent still have not heard or had access to the gospel, including nearly 70 percent of Niger. Christ does not call us to pursue danger, but he asks our obedience to his calling. Time and again, God has demonstrated his power over the enemy’s attacks and his ability to save. Whether it was the day my teammates and I were surrounded by a mob and about to be burned alive with a fire already lit under our vehicle, the illegal arrest warrants issued as vendettas, being chased from villages by shovels or rocks, or perhaps, the random death threat, nothing surprises God. Rather, it is an opportunity for his glory to be displayed. Still, there may come a day when physical deliverance doesn’t occur. Let it be known on that day, God is still faithful, and the greatest deliverance will have actually occurred. 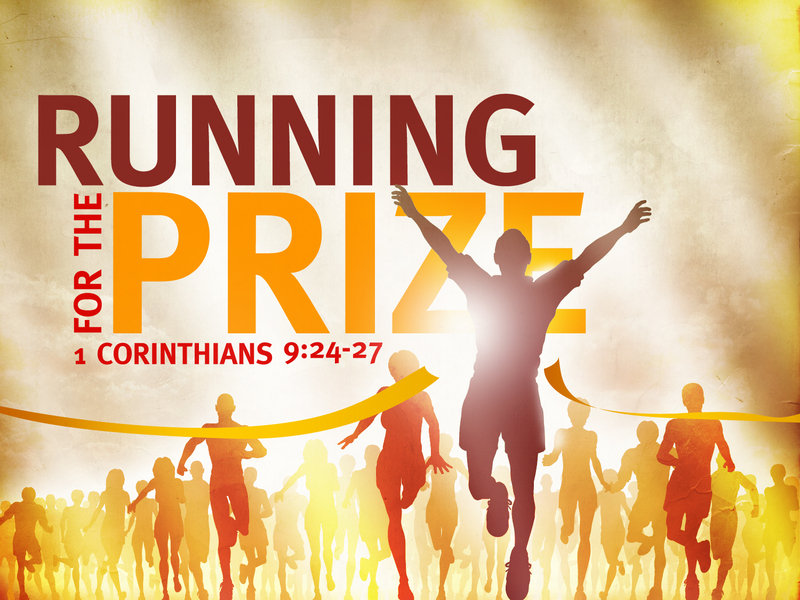 Whether we live or whether we die, Christ is our life, and his glory is the reward. Jesus Christ calls us to himself, not to a life of ease by avoidance, but of intimacy through obedience that we “may know him and the power of his resurrection, and may share his sufferings, becoming like him in his death” (Phil. 3:10). Nate Bramsen is the founder of ROCK International, a gospel-centered organization desiring to minister the love of Jesus to hurting children across the world. Though he currently lives in Niger, he travels extensively preaching God’s Word at conferences, universities, and churches, and hosts a weekly podcast entitled “Unfiltered,” available on iTunes.